It was Saturday 23rd of September 06. Nick and I decided upon a 24 hour trip to linear to fish Brasenose 1. We set off from Portsmouth at around midday and stopped off on the way for bait (Dinamite Source boilies) and some tackle. 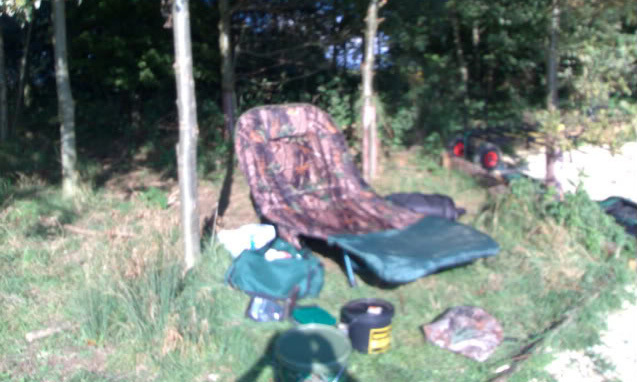 We arrived at the fishery at about 3pm and found a spot opposite the first car park with two pegs side by side. After ten minutes of sorting out my gear a very bad feeling was starting to sink in, I searched my holdall, went back to the car and nervously scratched my head as it became horribly apparent I'd left my oval brolly at home!!! Not much really I could do about it, home was too far away, I'd just have to sit it out and brave whatever the elements throw at me. Nick found this highly amusing! A young lad in the swim to my right came to my rescue in the shape of a 40 inch fishing brolly, not ideal but a help none the less. At least it covered half of my bedchair! We started fishing by about 4 pm but for the rest of the evening and all through the night I never had a bleep. I was fishing single Source bait on one rod and pineapple pop up on the other over a spod mix at around 60 yards range, just in between two weed beds. It was a beautiful evening until around midnight just as the bats had finished their supper we had a downpour, I couldn't get under Nicks brolly, there wasn't enough room so I had to rely upon the little shelter I had. The showers were on and off all night and my shelter started to leak after a while and by morning I had a puddle in the middle of my bedchair!! Nick couldn't stop laughing and named it Brasenose 3!!!!! Just to twist the knife even more he had a run at 8am and landed a pretty 9lb 12oz mirror, a gorgeous looking fish, to be perfectly honest a 3oz Gudgeon would have been most welcome! After I had dried out and had breakfast and hot tea spirits were raised somewhat and I sat by my rods enthusiastically waiting for some fish shaped response and an indication that It wouldn't be all for nothing. As each hour passed the thought of going home fishless was becoming more evident, although there is always that thing in your mind that in fishing anything can happen at any time and usually when you don't expect it. A little after 1 pm the young lad to my right had some action and after a hard fought 25 minute battle landed a perfect looking 13lb 6oz mirror, he had it on a single and very smelly bottom bait at range. I immediately reeled in my right hand rod and pulled a small pot from my bag, I'd had some Source boilies soaking in squid and octopus stuff for a couple of weeks and I must say, they were Minging!!!! I baited up, cast out as far as I could (only about 90 yards) and sat back full of renewed confidence. It must have been around 2.30 pm and Id almost given up all hope and even started to put some of my things away. 23 hours without a touch and my right hand rod sprang into action; I grabbed it, turned off the baitrunner and struck into what felt like a really powerful fish. I had to give a fair bit of line strait away and fed out almost 40 yards. When I eventually stopped it I had a horrible sensation on the rod tip, the fish had gone through a weed bed on that first run and as it came towards me there was this jagging feeling from the line cutting back through it. I was so afraid Id lose this fish but was still connected after 25 minutes and the beast was now within touching distance. I could tell that this was a good one, very heavy, possibly a new PB (my previous was 17lb 2oz also from this water) and now this was the last roll of the dice, Id got this far. 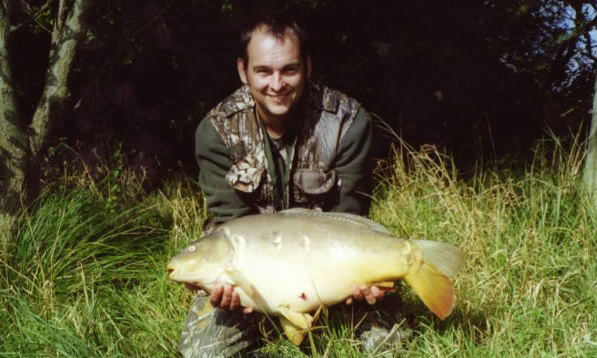 It was panic stations all the way until finally the arms of my landing net engulfed my prize and Nick hoisted ashore. I guessed this beautiful mirror to be my first twenty and with very shaky hands fumbled through my bag for my scales and sling. The amazing creature pulled the needle round to 26lb exactly, almost 9 lb heavier than my previous best. Nick took a few pictures, congratulated me and as I reluctantly put her back we watched as her tail almost waved us goodbye. Packing away and driving home I had this huge and wonderful grin on my face, although I don't really think it sank in until I got home looked at the pictures Id taken. If it wasn't for the fact I was miles from home I probably would not have stayed, no shelter, no activity, it seemed almost certain it wasn't going to be my day, but being on this lake is wonderful and I don't get the chance to come too often. It just shows that if you persevere, anything can happen!! !